That's the same experiment as Meyl's, except Eric is using a spark gap and incandescent bulbs on his receiver, and Meyl is using a signal generator and LED. So he equals Meyl's demonstration as far as the basic circuit is concerned, except Eric is actually using a loading coil on the ground end of the flat spiral coils to ensure the correct mode of resonance and current and potential distribution so he's not being deluded by harmonic resonant frequencies, then he goes on to show more single wire stuff that Meyl does not, and never has done, or has ever talked about. Eric then actually connects his transmitter to the earth, and receives the signal on the beach. So Meyl in no way shows what Eric doesn't. Meyl just shows power transfer through a wire to light an LED which is easy, which Eric also shows, and then a lot more. He's not attempting to show how much power can be received, only that it works. ... And he probably knows that he'd need more than a small sheet of metal resting in the sea water to receive a significant amount of power. Last edited by dR-Green; 04-07-2018 at 10:20 PM. From about 10 years ago - one wire transmission of real power - charging a cap until it triggers a neon, which in turn triggers a SCR, which in turn dumps that capacitor into another capacitor just to prove the point. No claims on anything but obviously receiver circuit is not even needed. ok but there is a subtle but critical point being overlooked here. That experiment is flawed because its in the nearfield. In order to claim its been transmitted via scalar, (tesla style) it has to be done as a farfield measurement. Granted you will say hey wait a minute, I seen meyls demonstration and that was not far field. That was my first response as well. However meyl said in the university experiments it was done far field and worked. The reason farfield is so important is to insure your readings are not the result of transformer induction. All these kids on youtube that are fascinated with lighting light bulbs are summarily dismissed out of hand by academics because they do not understand how to properly measure 'stuff'. These are things any old ham operating that built his own antennas takes for granted, but some what a lost art and skill today. So all he proved is that a near field transmitter can light a bulb, and frankly I can (and did) do that with any hertz resonating rod as well when they are sitting side by side. See the problem? Now had he lit a light bulb at the lake under that bluff, several hundred feet away, I'd have raised my eyebrows and said 'cool', likewise with the peking radio experiment. I believe that was the station he tuned to? The above should be clarify why one would need to qualify a TMT using strictly far field measurements. Take note that Adam (the guy who bought meyls coil) also made a point to mention far field. Last edited by Kokomoj0; 04-08-2018 at 04:07 AM. a spark is similar to an all frequency generator, so no matter what frequency your stuff oscillates at a spark is bound to find it, even if it doesnt the spark is charging the piece of wire which looks like an RLC circuit to the spark. The best way to understand this is to consider the effects of a resonating rod. Then there is the problem you run into again like before is when you try to do this at a distance. You can hit your one wire with a spark and 10 miles away you wont even be able to measure it because all the energy will be lost before it reaches the other end. I have this recurring vision of a marriage between tesla and stiffler devices. Last edited by Kokomoj0; 04-08-2018 at 08:16 AM. Granted you will say hey wait a minute, I seen meyls demonstration and that was not far field. I don't believe for one second that Meyl transmitted anything through the earth far field, and lit an LED on the other end. I wouldn't be surprised at all if he used a wire and then proclaimed it a success. I can do that easily. I'll just go and buy a 200 metre roll of wire and connect up the transmitter and receiver. I can guarantee I'll be lighting LEDs as well as incandescent bulbs 200 metres away, and if not then I can just write it in a book and everyone will believe me anyway. But that won't prove anything to me, lighting LEDs through 200 metres of wire isn't a big deal even if there is only one wire. Removing the wire and using the earth is another matter. I don't count my own experiments as a success over distance if I'm using a wire, so I don't count Meyl's experiments either. One standard. Wires don't count. According to Adam, Meyl would have had difficulty even making it work with a wire resting on the ground, so I don't buy in to his rhetoric at all. Anyway, I'm surprised you're happy using the term "scalar wave". I won't use it. Last edited by dR-Green; 04-08-2018 at 12:42 PM. Well meyls device is a high frequency low power proof of concept device so substituting a piece of wire for the earth is legitimate to a high degree since the earth is used presumably used as a short circuit (but not to high frequencies) and a piece of wire reasonably fulfills that [short circuit] qualification, unlike the earth [also at high frequencies] though it fails as a storage device so there wont be much 'pumping' taking place, and tesla is using the planet as a capacitor inside another capacitor so to speak, a wire not so much. Again people need to keep in mind that meyl dropped the generator output down so it was just enough to light the leds. That has to be part of the understanding and consideration of his experiment and also what must be taken into consideration is that meyl is using 7,000,000 cycles per second for the TMT frequency which I would not expect to go through the earth, remembering that tesla recommended around 35,000 cycles per second as optimum frequency for the earth. The earth as a conductor simply does not respond well (if at all) to higher frequencies and it simply absorbs them. then put a couple short ground rods in the salt water saturated sand and let er rip. That proves beyond a shadow of a doubt its not hertzian. You can be the first to prove that concept! I am not aware of anyone who has done that right so far except meyl and his frequency is too high to use through the earth. Im not sure if your frequency is low enough but it might work? No one (except tesla) lit an incandescent bulb either by wire or earth in the far field. It would not shock me ot discover that a unit the size of teslas would be required to prove that but I have my doubts that is the case. Yes I do accept using a wire as justified for proof of concept, especially at the high frequencies everyone uses to reduce the size and cost requirements. 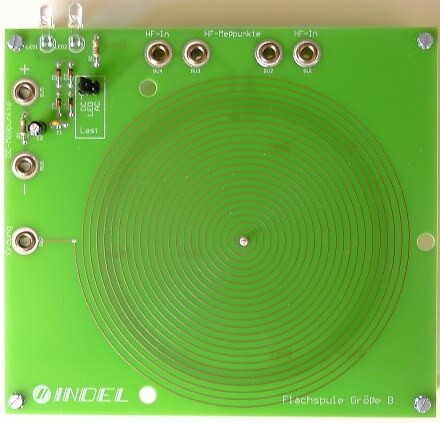 Maybe a table top model of the proper frequency can sufficiently pump up the earth to get results, no one knows because it has not been done yet by anyone but tesla who used a full scale model and if you know anyone who has please post the link! 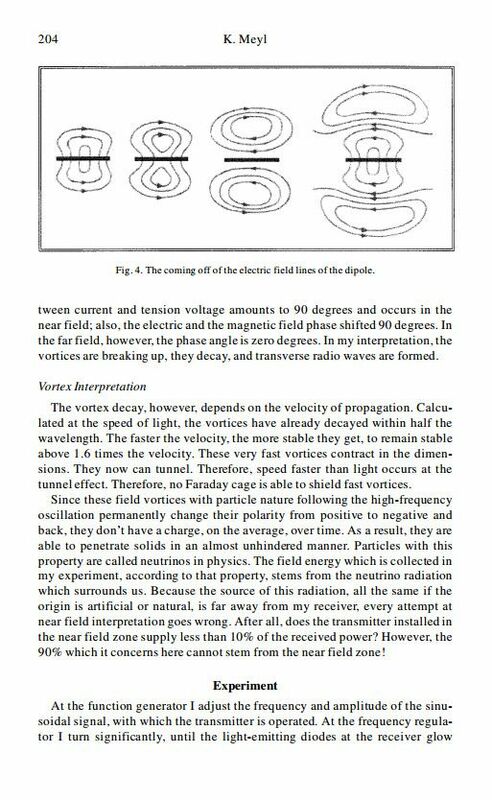 I cant comment too much on meyls unit not working with the wire on the ground but my best guess is that using such a high freq its simply dissipated by parasitic losses and failure to excite the medium in the same way a picosecond pulse wont even budge a 100 henry coil. Yours would be considered a low voltage unit to teslas as meyls would be considered a low voltage unit compared to yours. Like Adam I can imagine certain things going on that could cause that starting with the high freq and such a low voltage being transmitted, I think its 2 volts, I was surprised to discover that even worked, it does not surprise me that parasitic losses eat such a small signal up, just like they would a low voltage pulse over a 10 mile long wire as another example. If you lit a bulb with a 350-375 meter wire between your T/R, I would absolutely dub your TMT as a total success! Sure I have a problem with the word scalar, but nothing like the problem I have with einsteins time dilation '[meta]physics' and lot of other physics concepts that are accepted despite being wholly misrepresented and jammed down everyones throat simply because some dorkweed was able to build mathematical system (circular reasoning fallacy) around it. Which is not to say it does not come out with correct answers in the 'narrowest' sense, in the wider scope its total bs. One of the most laughable is getting younger than someone who is presumed stationary as one approaches the speed of light. That to this day has me in stitches! The main concern I have for your rig is that your frequency is substantially on the high side to use the earth as a conductor for far field operation and the energy may very well be eaten up by parasitic losses. Through-the-Earth (TTE) signalling is a type of radio signalling used in underground mines and caves that uses low-frequency waves to penetrate dirt and rock, which are opaque to higher-frequency conventional radio signals. In mining, these higher-frequency signals can be relayed underground through various antennas, repeater or mesh configurations, but communication is restricted to line of sight to these antenna and repeaters systems. Through-the-Earth transmission can overcome these restrictions by using ultra-low frequency (300–3000 Hz) signals, which can travel through several hundred feet of rock strata. The antenna cable can be located on the surface only at a mine site, and provide signal coverage to all parts of the underground mine. The antenna may be placed in a "loop" formation around the perimeter of the mine site (or wherever coverage is needed) for systems using magnetic fields to carry signals. Systems that use electric fields as the signal carrier are not subject to this limitation. Transmissions propagate through rock strata which is used as the medium to carry the ultra-low-frequency signals. This is important in mining applications, particularly after any significant incident, such as fire or explosion, which would destroy much of the fixed communication infrastructure underground. So there is always the possibility your design frequency is too high for far field propagation through the earth? the last couple links do not directly apply but one can get a larger overview of the scope they are dealing with imo. I should add that the reason this is important, that is measuring 2+ wavelengths from the transmitter is that it 'absolutely' insures there is no transformer type 'induction' between the transmitter and receiver coils. The reason all these tesla transmitter tests that you see out here are invalid is because no one takes that into account. Like so many claimed OU devices, they dont take proper measurements, or dont know how to properly measure their devices. Heres another kid thinks he has overunity, but its nothing more than failure to measure. The takeaway point from his video is when he takes the field meter and walks over 20 feet from the coil he still gets a reading, hence the need to be >2 wavelengths away from the source to insure its 'transmission' and not induction. Last edited by Kokomoj0; 05-05-2018 at 05:52 PM.